One group knows and respects the power of nature, is able to feel its majesty and is aware of our insignificance and smallness before the cosmos. The other, enamored of the machines that obliterate distance and effort, and that insulate us from the natural world in a technological bubble, is largely dead to the rhythms that sustain life. 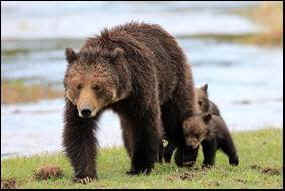 "Nobody wants to have to kill a bear," a park spokesperson said. "But it's a fine balance between public safety and preserving resources." Except that there’s no "balance" when it comes to humans versus the other animals. As the spokesperson says, the bears are simply "resources." On a summer Sunday afternoon, Highway 12 in Southern Utah is busy with cars and luxury coaches ferrying vacationers from all over the world to Bryce Canyon National Park, a natural wonder that could pass for fairyland with its thousands of red rock spires and panoramic views. All along the road, people stop to get photos of themselves standing next to one or other of these strange formations, known as hoodoos. Then it's back in the car or the bus and on to the next viewing spot. To the side of the road, almost out of sight of the motorized tourists, is a path for the much smaller numbers of hikers and cyclists carrying all their gear on their backs or bikes as they make their way onto any of the numerous trails that lead off into the wild. I was planning to ride one of these, the notoriously difficult Thunder Mountain bike trail, myself last Sunday. But I’d heard that parts of it are barely a couple of feet wide, with the mountain falling away precipitously on either side. So when I stopped at the visitor center for a map, and the assistant sized me up for a moment and then remarked that "Lots of people come back from there all bloodied," I took the hint and biked over to one of the other trails instead. There are dozens of national and state parks in the famous Golden Circle of Southern Utah, and each of them is unique and spectacular, whichever way you’re visiting them. But I couldn't help but note the difference between the thousands of people jumping in and out of cars and buses to take selfies, and those few along the trails who were having a somewhat deeper experience of nature. The following morning, I came across a post entitled "Evoking the Wrath of Nature" by Chris Hedges, the former New York Times war correspondent who writes passionately about the catastrophic times into which we’re heading. Hedges had been backpacking in New Hampshire with his wife and kids, and at the top of Mount Washington, he’d found himself among "backpackers huddled in the biting chill next to large boulders or congregated in the lobby of a snack bar and gift shop that extract money from the thousands of tourists who ride the cog railroad or drive up the auto road from the base of the mountain each summer." This strange confluence, where those who hike to the peak and those who ride in cars and trains meet in uneasy silence, is emblematic of the clash of cultures that threatens to doom the planet and the human species. Hedges writes about the Abenaki ("people of the dawn") who lived for thousands of years in the shadow of the mountain they knew as Agiochook, home of the Great Spirit Manitou, and that the Europeans had renamed after George Washington. 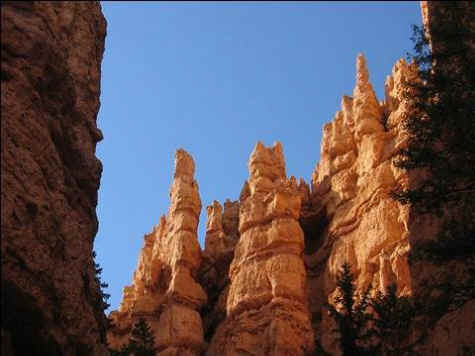 Here in Southern Utah, the Paiute people knew what we call Bryce Canyon as Unka-timpe-wa-wince-pock-ich – "red rocks standing like men in bowl-shapes." These hoodoos, according to Paiute mythology, were "legend people" who had been turned to stone by the Coyote spirit. When the Europeans colonized the area, they named the canyon after Ebenezer Bryce, a rather dour Scottish immigrant who, when asked what it was like to live in this wondrous place, replied: "It’s one heck of a place to lose a cow." Hedges writes that when the Europeans discovered Agiochook/Mount Washington, they thought the crystals in the rock formations were diamonds, and were disappointed at having to settle for farms instead of diamond mines. Armed with guns, alcohol and lethal diseases like smallpox, tuberculosis and syphilis, they proceeded to wipe out the native communities. The few Abenaki who remained were often kidnapped and enslaved domestically or sent in chains to work in the sugar plantations of the West Indies. Land, timber, minerals, animals and mountains – as well as human beings – had no intrinsic value to the Europeans. Nature existed only to make money. To the bear, on the other hand, it was the human wandering into her territory who was the resource. Perhaps that's what's most alarming to us humans. As the mass extinction we’re bringing on gathers steam all around us, the artificial world we’ve constructed becomes increasingly precarious. The realization begins to dawn on us that we are not, after all, masters of the earth. Our species was born in the wild, and the wild is not just a place you can motor in and out of; it’s both beautiful and cruel, it delivers both life and death, it’s a place of both wonder and terror. I had a chance to ask Sussman about this several years ago, shortly after a young woman had been attacked by a mountain lion near San Diego. "The reason we have such shock about this kind of incident," he replied, "is that for millions of years, man was actually a prey species. It’s as simple as that." Sussman explained that we like to think of ourselves as being in control of our environment. "But nature is a very shocking thing because it’s a natural phenomenon that we cannot control. Ecologically and psychologically we were, until very recently, meals for large, frightening animals. It is only within our artificially sanitized Western world that humans can think of themselves as the macho, meat-eating, kill-’em-dead top predator." Whether we're scaling Mount Washington on a cog railway, taking selfies as we check off the "natural wonders" on our bucket list, or maintaining Yellowstone as a safe "resource", we're not really rediscovering our connection with nature; we’re just drifting yet further away from any true understanding of our place in the scheme of things. Which leaves us helpless to take meaningful action when the real world of nature begins to take apart the artificial construct we call civilization. The world does not fit into the rational boxes we construct. It is beyond our control and finally our comprehension. Human beings are not the measure of all things. Existence is a mystery. All life is finite. All life is fragile. The ecosystem on Earth will die. It will be slain by our failure to protect it, or it will succumb to the vast array of natural forces, from colliding asteroids to exploding stars – including, one day, our sun – which turn into supernovas and throw out high-energy radiation that have doomed countless planets in the 100 billion galaxies beyond ours. We have lost the capacity for reverence. We slew those who tried to warn us. Now we slay ourselves.